Extreme Technology Corporation, the parent company of ET Grow, is located in the beautiful Niagara Region of Ontario, Canada. Situated among acres of vineyards, countless farms and over 70 greenhouses, ET Grow is in our roots. It only makes sense that since our inception in 2001, our team has worked with countless clients in the horticultural and agricultural sectors. We’ve grown to know these businesses quite well. We’ve seen their locations first-hand and how they operate. We saw a need for technological solutions in the horticultural industry. Our goal has been to improve the efficiencies of these companies on an international scale, combining our knowledge with their needs. We aim to provide solutions that streamline processes and increase cost savings - ET Grow is just that solution. While visiting one of our clients in 2012, we first discovered the common method used for tracking new plant trial data - a clipboard. At the time, none of us realized that this clipboard, although covered in dirt and water, would change the future of our company forever. As a software company, it instantly called on our technology-oriented brains for a solution. The clipboard, full of valuable data, was unreliable, easily lost or misplaced, and provided no records for future use and/or sharing. We’re programmed to constantly think ‘how can we make this better, easier, or faster?’. That said, in March 2013, the foundation to ET Grow began with the launch of Trial Tracker – a web platform and mobile application that allows for centralized data collection for new trials. Extreme Technology saw an area where technology could increase efficiencies in the horticultural/agricultural industries – not just in trialing data, but throughout the entire operation. This lead to the creation of a full end-to-end solution for these sectors, which we now know as ET Grow. 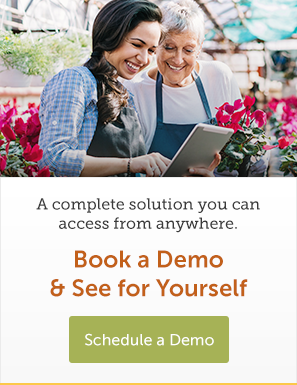 Our platform is all-encompassing, taking you from ‘seed to sale’, including programs for crop management, ordering capabilities, rack inventory management, merchandising tools and so much more.